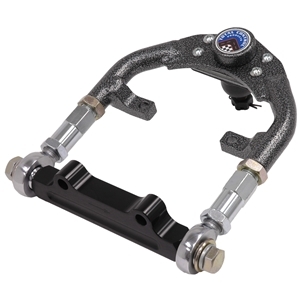 Tubular Upper Control Arms with 1" Offset Pivot Shaft - Fits 1964-66 Mustang and various Ford/Mercury models from 1960-66 - Offset pivot shaft increases negative camber gain. Arm lengths adjustable for caster and camber. Includes fully assembled arms, mounting shims, and Grade 8 mounting hardware. Note: Must upgrade to V8 spindle.